This is our pet house rabbit. 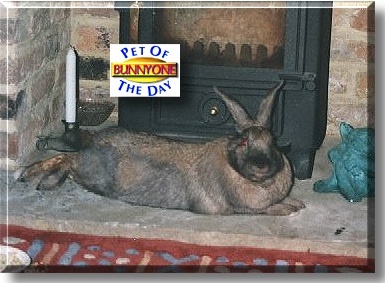 His name is Bunny One, he is nearly three years old and lives with us in Bedfordshire, England. He loves watching the Simpsons on television. Every morning he greets us by running round and round our feet and stopping on each lap to be stroked and to lick the our hands. In the evening he loves nothing better than to lie in front of the TV with us and to push his head under our feet to have his head stroked. Bunny One is probably the only pet we know of who managed to house train himself without any effort from us. Pet Talk: Be one of the first to try our new bulletin board!